MANAdev give a powerful tool set to modify visualization of selecting colors, as well as setting up other types of pickers. Here is a guide for customizing color and image swatches. 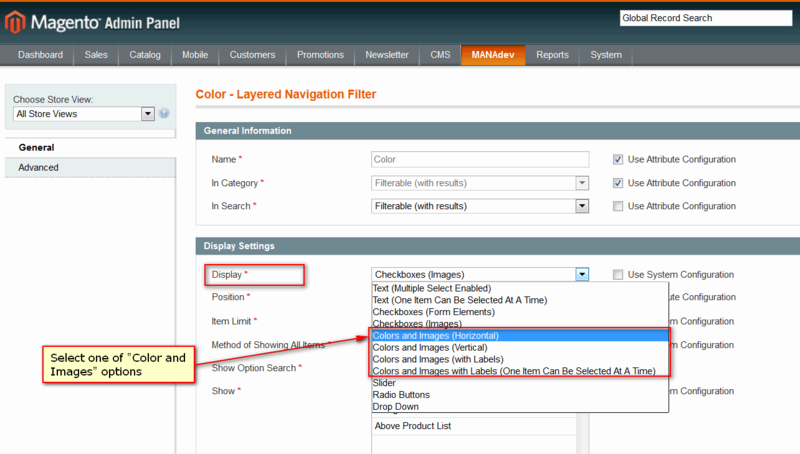 In Magento Admin Panel go to menu MANAdev-> Layered Navigation, find attribute and open it for editing. 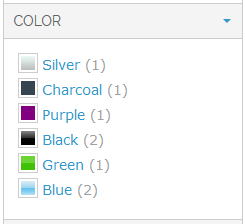 For color swatches, filter Color can be selected. Hint: If you cannot see any change in frontend, after you change the parameters, try to refresh your browser cache by pressing Ctrl + F5. When Display parameter is set to one of above option, additional tab Colors and Images will appears. 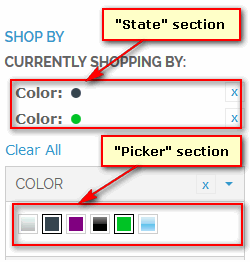 Here you can finalize your color picker visualization. Width and Height will define size of color swatch. Image, Selected, Mouse Over and Selected Mouse Over This section allows to add additional top layer over all swatches which might be used as a mask to give specific shape for a swatch (for example heart shape swatches) or additional border. Graphical file for the mask can be uploaded using buttons Add or Change, or can be removed, if you do not need it anymore. Width andHeight will define size of state element. Border Radius allows to round corners to an element, where 0 means square. Image is a mask for element, which will be applied to on top of selected element image.Graphical file for the mask can be uploaded using buttons Add or Change, or can be removed, if you do not need it anymore. Position is relative position of the option in the whole palette. Name is a swatch name. Can be visible in a a label, if filter display type is "Colors and Images (with Labels)", or in tooltip, when mouse is over the element. Color - swatch color, which will be shown, if image is not provided.. Using color selecting control you can set a Hex value of the color of a swatch. Image - is a graphical image, uploaded from a file. Will be used to show the swatch element. 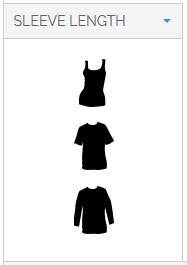 Selected Image - is a graphical image, which will be shown when option is selected. If not provided, picture from Image parameter will be used. Mouse Over is a graphical image, which will be used when mouse is over the option. If not provided, picture from Image parameter will be used. Selected Mouse Over is a graphical image, which will be shown when mouse is over the selected element. If not provided, picture from Image parameter will be used. 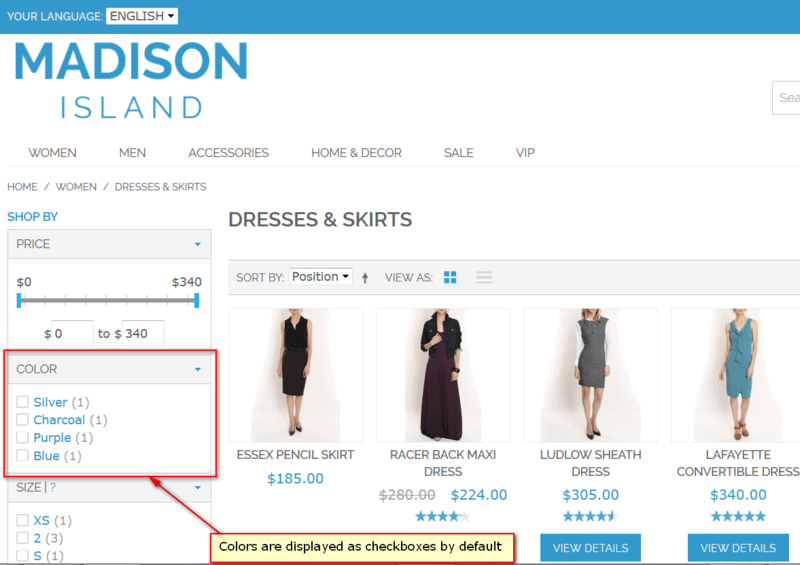 In case you want to have image picker, you can upload images for different states: ordinal image, image when item is selected, ordinal image when mouse is over the item and selected item when mouse is over it. Hint: In case image picker should look the same in spite of the state of the filter - normal, selected, mouse over it or selected with mouse over it - it is recommended to set the image only for one Image column. It will help to avoid image flicker. Here is the example of Length filter configuration.